2005-09-04. Good. Ships with Tracking Number! INTERNATIONAL WORLDWIDE Shipping available. May not contain Access Codes or Supplements. May be ex-library. Shipping & Handling by region. Buy with confidence, excellent customer service! Prentice Hall, 2005-06-20. 6. Hardcover. Used:Good. Pearson. Hardcover. 0133456315 US Edition Textbook, May Have Highlights, Notes and/or Underlining, BOOK ONLY-NO ACCESS CODE, NO CD, Ships with Emailed Tracking from USA . Good. 2005-03-01. New. Ships with Tracking Number! INTERNATIONAL WORLDWIDE Shipping available. Buy with confidence, excellent customer service! Pearson. Hardcover. 013447208X . New. 2014. Pearson College Div. Hardcover. 0132164949 New US Edition Textbook, Ships with Emailed Tracking from USA . New. 2017-01-30. New. Ships with Tracking Number! INTERNATIONAL WORLDWIDE Shipping available. Buy with confidence, excellent customer service! Pearson. Hardcover. 013447208X Special order direct from the distributor . New. 2008-04-08. New. Ships with Tracking Number! INTERNATIONAL WORLDWIDE Shipping available. Buy with confidence, excellent customer service! Prentice Hall, 2014-01-25. Hardcover. Good. 2007-01-04. Good. Ships with Tracking Number! INTERNATIONAL WORLDWIDE Shipping available. May not contain Access Codes or Supplements. May be ex-library. Shipping & Handling by region. Buy with confidence, excellent customer service! 2014-01-25. Good. Ships with Tracking Number! INTERNATIONAL WORLDWIDE Shipping available. May not contain Access Codes or Supplements. May be ex-library. Shipping & Handling by region. Buy with confidence, excellent customer service! Pearson. Hardcover. 013447208X BRAND NEW W/FAST SHIPPING! 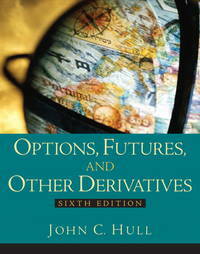 This item is: Options, Futures, and Other Derivatives, 10th Ed., 2018, by Hull, John C.; FORMAT: Hardcover; ISBN: 9780134472089. Choose Expedited for fastest shipping! Our 98%+ rating proves our commitment! We cannot ship to PO Boxes/APO address. To avoid ordering the wrong item, please check your item's ISBN number! . New. Pearson. Hardcover. 0133456315 Item in very good condition! Textbooks may not include supplemental items i.e. CDs, access codes etc... . Very Good. 2017-01-30. Good. Ships with Tracking Number! INTERNATIONAL WORLDWIDE Shipping available. May not contain Access Codes or Supplements. May be ex-library. Shipping & Handling by region. Buy with confidence, excellent customer service! 2000-03-02. New. Ships with Tracking Number! INTERNATIONAL WORLDWIDE Shipping available. Buy with confidence, excellent customer service! Pearson. Hardcover. 013447208X US Edition Textbook, May Have Highlights, Notes and/or Underlining, BOOK ONLY-NO ACCESS CODE, NO CD, Ships with Emailed Tracking from USA . Good. Pearson College Div. Hardcover. 0132164949 US Edition Textbook, May Have Highlights, Notes and/or Underlining, BOOK ONLY-NO ACCESS CODE, NO CD, Ships with Emailed Tracking from USA . Good. Pearson. Hardcover. 013447208X New US Edition Textbook, Hardcover Book with Access Code, Ships with Emailed Tracking from USA . New. Pearson. Hardcover. 0133456315 Item in good condition. Textbooks may not include supplemental items i.e. CDs, access codes etc... . Good. Prentice Hall, 2008-08-04. 7. Paperback. Used:Good. Prentice Hall, 2000-01-15. 4 Har/Dsk. Hardcover. Used:Good. Pearson College Div, 2011-01-01. Hardcover. Good. Prentice Hall, 1997-04. Hardcover. Good. 2002-07-03. New. Ships with Tracking Number! INTERNATIONAL WORLDWIDE Shipping available. Buy with confidence, excellent customer service! Pearson. Used - Very Good. Former Library book. Great condition for a used book! Minimal wear. Prentice Hall. Hardcover. 0130090565 New Condition *** Right Off the Shelf | Ships within 2 Business Days ~~~ Customer Service Is Our Top Priority! - Thank you for LOOKING :-) . New. Pearson. Hardcover. 0133456315 Same or next day processing! GREAT shape! May have some minor physical wear, light to no markings/highlights! ! Choose EXPEDITED for super fast delivery! * . Very Good. PEARSON EDUCACION DE MEXICO. 0273759078 . New. 2013. Prentice Hall, 2002-07-03. 5. Hardcover. Used:Good. Pearson Education. PAPERBACK. 0135009944 Brand new book. International Edition. Ship from multiple locations. 3-5 business days Express Delivery to USA/UK/Europe/Asia/Worldwide. Tracking number will be provided. Satisfaction guaranteed. . New. Pearson College Div, 2011-01-01. Softcover. New. (CD INCLUDED)***International Edition***Soft cover/Paperback*** Textbook printed in English. ***Brand New***. Most international edition has different ISBN and Cover design. Some book may show sales disclaimer such as "Not for Sale or Restricted in US" on the cover page but it is absolutely legal to use. All textbook arrives within 5-7business days. Please provides valid phone number with your order with easy delivery. Delhi: Pearson, 2009. Paperback in good condition. Seventh edition. CD-ROM included. This edition manufactured in India. Covers are scored and lightly marked. Leading corners, edges and spine are worn, bumped and creased, affecting pages. Cover film has peeled and torn slightly on edges. Page block and some pages are lightly marked. Text remains clear throughout. Binding is sound. HCW. Paperback. Good. Used. For undergraduate and graduate courses in Options and Futures, Financial Engineering and Risk Management, typically found in business, finance, economics and mathematics departments. Also suitable for practitioners who want to acquire a working knowledge of how derivatives can be analyzed.This best seller represents how academia and real-world practice have come together with a common respect and focus of theory and practice. It provides a unifying approach to the valuation of all derivatives-not just futures and options. It assumes that the reader has taken an introductory course in finance and an introductory course in probability and statistics. No prior knowledge of options, futures contracts, swaps, and so on is assumed.